Is Justin Verlander Already A Hall of Famer? Every night for fun, I like to spend time on the Baseball Reference website looking up undervalued players. It’s the rabbit hole that is my usual evening. Last night I started with Sandy Koufax’s stats and started looking up similar players. Koufax’s career was ridiculous and much like Chris Borland, he retired due to injury concerns regarding his arm in the absolute prime of his career. From Koufax I went to Ron Guidry who in my opinion is borderline Hall of Fame worthy. His career led me to Verlander. Now we all know just how good Verlander is, but thanks to Max Sherzer, his name has fallen a little off the map. His numbers are astounding. In 10 seasons, he has won 15 or more games seven times! He has won the Rookie of the Year, a Cy Young award and a MVP award. He has 152 career wins and 1830 strikeouts, and he will turn 32 this year. If he were to retire today, his black ink score is 46, where ~40 should put you in the Hall of Fame. To give you reference, Tom Glavine’s was a 29 and he got in. The only pitcher that I found with stats as dominant as his over that long a stretch of time is Mike Mussina (who also deserves to be in the Hall of Fame), who has a 19 black ink score. There was a time when Justin was younger that his cards were white hot, but that has changed over the years. With the emergence of so many young dominant pitchers, Verlander’s value in cards has stalled. You can find his autographed cards on eBay for a staggeringly lower value than they should have. 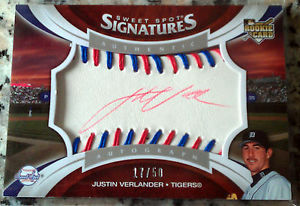 I’ve seen some of his certified autographed cards go for as low as $9.99 and as high as $31. For a player of his merit, you would expect o pay much more. I feel his cards are way undervalued and should see a correction if he ever makes it to the Hall of Fame. How do you see it? Is his career Hall of Fame worthy at this point? If he retired tomorrow would he be in?